Residential Solar Power Is Now In The Garden And All Around The Home! Residential solar power can be found in the garden with solar garden fountains, wind chimes and solar outdoor lighting. It is also found in the home providing your electricity, heating you water or running a solar attic fan. As you can see solar power in many different forms is becoming more and more prevalent in homes everywhere. Some of these technologies are expected and other are quite unique. Or sit back and relax while you cool off with a solar fan. The use of solar power can also provide security and peace of mind by owning a solar generator. In case of a loss of electricity, you will have power to operate small appliances and other electronics. There are other necessary functional aspects about your home that cannot be ignored but are typically out of sight and out of mind, yet they are using power on a regular basis. 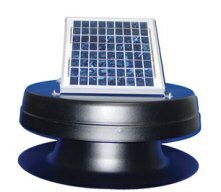 Why not replace your typical power draining attic fan or roof vents with a solar attic fan or solar power roof vents. Once you install them, you can forget them, and then reap the benefits of saving money, because these are going to run off of the suns Free energy. There are many ways for you to be a part of the solar generation and make your home an energy efficient solar home. Check out all of these residential solar power products below to learn more about them and decide if they can help you reduce some of your home operating costs. Return from residential solar power to home page. 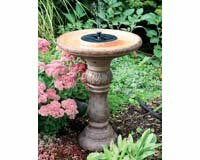 Solar Garden Fountains Click Here. Solar Pond Fountain Click Here.